This morning I went off with the trailer to Homecenter, little thinking what problems I might encounter. 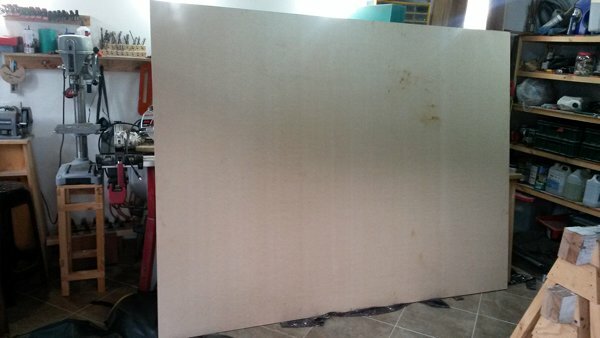 I had called in yesterday, and made the decision not to buy plywood to top the base, the price has shot up, and I was able to buy one sheet of 9mm MDF 2.44m x 1.83m for £10-60 / $16, as opposed to two sheets of MDF for a total of £30 / $45. initially I had planned to put the sheet in my trailer diagonally with one long edge down in the trailer the other resting on the side. I took a 1.8m length of timber with me to act as a support across the middle. Then came my next problem, I needed to get the tailboard off my trailer which measures 1.7m long by 1,3m wide, I was in the car park of Homecenter, having paid for the MDF but fortunately not having gone to the collection point, and the rod connecting the board to the trailer had corroded, I had not given it a thought when I was greasing everything the other week, it wasn't going to budge. So back into the store, and bought a lump hammer, which which a bit of persuasion, removed the rod, I then removed the tail board and roped it in the trailer. I then drove around to collect the MDF, we put in in the trailer, only to decide it was sticking out too far, so I ended up putting it on top of the trailer, but then I couldn't put the tailboard back with the number plate! I decided to risk it. The board was well secured, and wasn't going anywhere. I took it slow so that the wind would not try and lift the board, when ahead, I saw a major Transito (Traffic Dept) road check, my heart sank, however I think they were just setting up, and I was was ignored. Back home, I was able to slide the MDF off the trailer, and using my sack truck, get it near to the workshop entrance, once on the tiles, I was able to slide it without causing it any damage. Now I have just got to cut it without snapping it in two in the process. Anyone need a lump hammer!!!! ?